William Albert Sweatman was born in Leamington, Warwickshire in 1845 (reg. second quarter), the son of William Sweatman (born Bloomsbury c.1818) and Ann Blake (born Claypits, Manley, Lincolnshire c.1822), who were married in the Chipping Sodbury district in the third quarter of 1840. William Albert’s father William was a coachman, and at the time of the 1851 census William Albert (5) was living with his parents and his younger brother George (2) in the home of his widowed grandmother at Albion Cottage, Wise Street, Leamington Priors. By 1861 the family had their own home at Nasby Cottage, Tower Street, Leamington Priors. His mother, who only had two children, was working as a milliner, and William Albert (15) was already working as a printer, a career which was to bring him to Oxford and which he followed for the rest of his life. The family had three lodgers: a blacksmith, and a married actor and actress. Mary Dodd Sweatman (born at 48 Wellington Square, Oxford in 1884 and baptised at St Giles’s Church on 9 November); died aged three. William Albert Sweatman and Mary began their married life at 8 Cowley Road, where they can be seen at the time of the 1871 census with their first son, and they remained in East Oxford (probably at that house) until at least the end of 1878. William was working as a printer & compositor. By the time of the 1881 census the family had moved to 134 Walton Street in St Mary Magdalen parish, and William was now a printer’s foreman (probably with Oxford University Press). He and his wife spent census night at home with their first five children, as well as his sister-in-law Miss Sarah Dodd (stated to be 25, but her age varies), and two boarders. Their eldest son George attended Oxford Boys’ High School in George Street, where he won the first prize in Greek in 1886, and their second and third sons, William Henry and Frederick, went to New College School: all appear in the Oxford Local Examinations lists in in Jackson’s Oxford Journal. Their fourth son Sydney attended the Oxford City Technical School, where he won prizes for commercial arithmetic and book-keeping. The family did not live at Walton Street for long, as by early 1883 they had settled at 48 Wellington Square in St Giles’s parish. On 9 October 1886 it was announced in Jackson’s Oxford Journal that their eldest son George Albert Sweatman of the Oxford High School for Boys, formerly chorister of The Queen’s College, had been elected to a Thomas Exhibition at that college, to the value of £70 a year, and he read Classics, obtaining his B.A. in 1889. † Mary Dodd Sweatman died at 48 Wellington Square at the age of three on 28 November 1887 and was buried at St Sepulchre’s Cemetery on 3 December (burial recorded in the parish register of St Giles’s Church). William and Mary Ann Sweatman were still at 48 Wellington Square at the time of the the 1891 census, and Mrs Sweatman’s sister, Miss Sarah Dodd (37) had come to live with them, and they also had two boarders. Five of their six surviving children were still at home: William (19) was an upholsterer’s apprentice; Frederick (18) was a clerk; Sydney (15) was a library assistant; and Edgar (12) and Walter (8) were at school. The missing son, George (22), was in 1891 the Master of the Crossley & Porter Orphan Home & School at Savile Park, Skircoat, Halifax. In the third quarter of 1899 in Chesterton, Cambridgeshire (with the banns read at St Giles’s Church in July), Frederick John Sweatman (26) married Mary Harriette Metcalfe (born in Cambridge in 1870/1). In 1901 William & Mary Sweatman were living at 80 St Bernard’s Road (which then had the address Sunny Dene, St John’s Road) with their youngest son Walter (18) and Mary’s unmarried sister Sarah Dodd (49). William was a printer’s manager, and his son Walter a printer’s apprentice. Their two other unmarried sons had moved away from Oxford: Sydney (24) was an assistant master at the Manor House School in Clapham, and Edgar (22) was a furnishing assistant in Taunton. In the third quarter of 1901 in the Droitwich district of Worcestershire, Sydney Edward Sweatman married Amy Isabelle Eugenie Allen of Clapham, London. In 1911 William (65) and Mary (63) were still living at 80 St John’s Road with Walter (28) and Sarah Dodd: both father and son were described as printers. On 30 December 1911 at St Mary Le Park Chapel of Ease, Battersea, Edgar Charles Sweatman (32), described as a furnishing manager of 2 Kassala Road, Battersea, married Adaline May Boxall (29) of Bournemouth, the daughter of the army quartermaster William Boxall. On 18 February 1917 at St Saviour’s Church, Highbury, Walter Herbert Sweatman (33), described as a temporary civil service clerk of 48 Highbury Grove, married Marguerite Clara Fisher (24) of 5b Highbury Grove, the daughter of the actor Harry Fisher. Their son William Henry Sweatman had been working as a decorative artist in 1901 and living with his wife Alice and daughter Alice (2) at 128 York Mansions, Prince of Wales Road, Battersea. On 3 March 1920 William (48) and Alice (44) set sail from Southampton to New York on the Adriatic, with his occupation given as “buyer”. He died in Ontario at the age of 50 on 22 August 1921 and was buried at Mount Pleasant Cemetery, Toronto. His name was added to his little sister’s grave in St Sepulchre's Cemetery. † Mrs Mary Ann Sweatman, née Dodd died at Junior House, Oakham, Rutlandshire at the age of 73 on 7 August 1922 and was buried at St Sepulchre’s Cemetery on 11 August (burial recorded in the parish register of St Giles’s Church). Administration was granted to her husband, and her effects came to £131 17s. 10d. 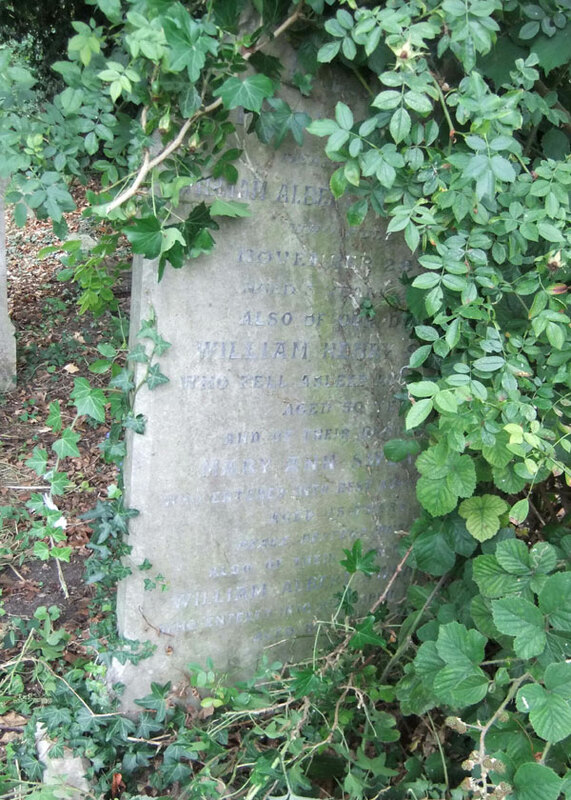 † William Albert Sweatman died at Leamington at the age of 84 on 12 April 1930 and was buried at St Sepulchre’s Cemetery on 16 April (burial recorded in the parish register of St Giles’s Church). Probate was granted to his sons Frederick John Sweatman, librarian, and Sydney Edward Sweatman, schoolmaster, and his effects came to £9,515 2s. 6d. Frederick and his wife and daughter moved into his house at 80 St Bernard’s Road. Miss Sarah Dodd, the unmarried sister of Mrs Mary Ann Sweatman who had lived with her family died a couple of months after her brother-in-law, and was buried in an adjoining grave in St Sepulchre’s Cemetery (Row 23, Grave F26½). George Albert Sweatman (born 1868), who was ordained after getting his degree in Classics, remained a schoolmaster. In 1901 George (32) and Ann (26) were living at Sunnydene, St Margaret-at-Cliffe, Dover. George died at Woodford College, George Lane, Woodford, Essex at the age of 58 on 6 April 1927. His effects came to £575. Sydney Edward Sweatman (born 1876) was aged 34 at the time of the 1911 census and had his own prep school, Surry Dene School at St Margaret-at-Cliffe, Dover, where he lived with Amy (39) and their children Eric (5), Edward (3), and Ruth (seven months). He was described as a retired schoolmaster in 1936 when he was the executor of his brother Frederick’s will. Sydney’s wife Amy died in Tonbridge at the age of 70 in the first quarter of 1943; he survived her by 18 years, and was living at 39 Cambridge Road, Girton, Cambridge at the time of his death at Brookfields Hospital, Cambridge at the age of 89 on 1 June 1965. Probate was granted to his second wife Gwladys, and his effects came to £3,290. Edgar Charles Sweatman (born 1878) and his wife Adaline appear to have had the following children: Betty (1913) and Peggy (1916) at Brentford; Norma (1921) at West Ham; and Barbara (1926), Roy (1929), and Sonia (1932) in Oldham. Edgar was living at 291 Church Road, Northolt Middlesex at the time of his death at the age of 65 on 29 August 1965, but died in the Stratford-upon-Avon Hospital. His effects came to £1,914. Walter Herbert Sweatman (born 1883) and his first wife Marguerite do not appear to have had any children. In the third quarter of 1941 in Croydon, he married his second wife, Nellie Georgina Thumwood. In 1945 he was living at 71 Weyland Road, Headington and from 1949 to 1956 at 55 Ramsay Road, Headington. He died in Oxford at the age of 74 on 7 October 1957. His effects came to £7,385 18s 19d.